Growing peaches in the home garden can be a real treat, but not everyone has space for a full-sized fruit tree. If this sounds like your dilemma, try a Honey Babe peach tree. This pint-sized peach usually grows no taller than 5t or 6 feet (1.5 to 2 meters). And it will provide you with a truly tasty peach. When it comes to growing a compact peach, Honey Babe is about the best you can do. This dwarf tree is typically only five feet tall and no wider. You can even grow this peach tree in a container on a patio or porch, as long as there is enough sunlight and you provide larger containers as it grows. 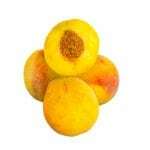 This is a firm, freestone peach with yellow-orange flesh. The flavor is of the highest quality so that you can enjoy Honey Babe peaches fresh, right off the tree. They will be ready to pick in July in most regions, but there is some variation depending on your location and climate. 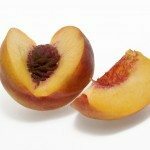 In addition to fresh eating, you can use these peaches in cooking, baking, and for preserves or canning. Growing a Honey Babe peach tree is not difficult, but you do need to take some early steps to ensure it will thrive. Find a spot for it that will provide full sun and amend the soil if yours is not very rich. Make sure the soil will drain and that your tree won’t suffer from standing water. Water your peach tree regularly in the first growing season, and only as needed after that. You can use fertilizer once a year if desired, but if you have good, rich soil it isn’t strictly necessary. Honey Babe is self-fertile, but you will get more fruit if you have another peach variety nearby to help with pollination. Pruning of the Honey Babe tree is important if you want to keep it looking like a tree. Without regular trimming, it will grow more like a shrub. Pruning once or twice a year will also keep your tree healthy and productive, preventing disease and providing you with year after year of delicious peaches.